In a state-of-the-nation speech Tuesday that dwelled on overcoming the persistent weaknesses sapping Russia, President Dmitry Medvedev suggested that failure to reach agreement on missile defense cooperation in Europe could set off a new arms race in the decade ahead. Those dark remarks appeared aimed as much at his own generals as at the West. Medvedev has indicated that he wants to bend the nation's resources toward diversifying the economy rather than restoring the military-industrial complex of old, and the Kremlin has come to see arms control as in its own interests. Medvedev did not mention the still-unratified nuclear arms agreement with the United States, but he spoke approvingly of a summit in Lisbon on Nov. 20 where he discussed the eventual goal of Russian cooperation with NATO on a European missile defense system. "It goes without saying that was a positive development," he said. "But in this room, I would like to openly say that the choice for us in the coming decade is as follows: We will either come to terms on missile defense and form a full-fledged joint mechanism of cooperation or . . . we will plunge into a new arms race and have to think of deploying new strike means, and it's obvious that this scenario will be very hard." 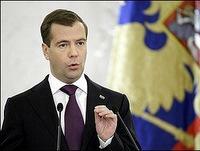 Lack of agreement on arms issues would be the worst-case scenario for Russia, said Irina Kobrinskaya, a political analyst with the Institute of World Economy and International Relations at the Russian Academy of Sciences, pointing out that Medvedev devoted the bulk of his speech to plans for overcoming domestic debilities. "For Russians, we all know that it was the arms race that led to the disintegration of the Soviet Union," Kobrinskaya said. "Russia is not ready financially for a new arms race." As if to underscore the point, the commander of Russia's Strategic Rocket Forces told reporters Tuesday that about 20,000 jobs have been cut from those forces over the past five years. And Nikolai Makarov, chief of the Russian General Staff, denied a Wall Street Journal report that Russia has been moving missiles near NATO countries. "We did not deploy any missiles in the Kaliningrad region," Makarov told the Interfax news agency. Kaliningrad is a Russian enclave tucked between Poland and Lithuania, both of which are NATO members. Medvedev was delivering his third state-of-the-nation address to the government, both houses of parliament and religious leaders, including the patriarch of the Russian Orthodox Church, who entered with Prime Minister Vladimir Putin. He spoke in St. George Hall in the Grand Kremlin Palace, a 65-yard-long gleaming white testament to wealth, power and majesty, with its enormous bronze chandeliers and twisted columns supporting a vaulted ceiling. Yet Medvedev described a country that is losing a trillion rubles - about $32 billion - annually to bribery, theft and corruption and remains weakened by the low birthrate of the 1990s, which caused a drop in the population. Much of his 75-minute speech was devoted to the theme of protecting Russia's children and nurturing a generation capable of rebuilding the country. His audience clapped often, though not in the openly partisan manner of a U.S. State of the Union audience. Russia's is essentially a one-party system, despite the few Communists in the hall. Even though the child mortality rate is dropping, Medvedev said, one-third of Russian children have health problems when they start school, as do two-thirds of teenagers. In addition, 100,000 children are victims of violence every year. "It breaks your heart," he said. The president urged the European Union to help Russia enter the World Trade Organization and called for closer partnerships and economic ties with the United States. "Foreign policy must manifest itself not only in missiles but also on concrete achievements, clear to our citizens, in setting up joint ventures in Russia, in the emergence of quality inexpensive goods, in job creation and in relaxed visa procedures," he said. "We are renewing our country."